Not to be confused with insulation, insolation refers to the incident solar radiation that reaches the Earth from the Sun. At an average distance of 150 million kilometres from the Sun, the outer atmosphere of the Earth receives approximately 1353 W/m2 of insolation (NASA 1971). This varies by around +/- 2% due to fluctuations in emissions from the Sun itself as well as by +/- 3.5% due to seasonal variations in distance and solar altitude. As solar radiation passes through the Earths atmosphere, some of it (25%) is absorbed and scattered by air molecules, small airborne particles, water vapour, aerosols and clouds. Some of the radiation is reflected straight back out into space (20%) but much more with increased cloud cover. The rest arrives at the surface of the Earth, where some of it is reflected immediately back into the sky. This amount depends on the nature and type of the actual surface – fresh snow can reflect up to 95% while desert sands reflect 35% – 45%, grasslands 15%-25% and dense forest vegetation 5%-10%. Sometimes less than 50% of the solar radiation arriving at the outer atmosphere actually reaches the surface of the Earth. It is the scattered component that makes the sky look bright and provides the ambient diffuse daylighting used in buildings. Without it, the sky would look as black as night with the Sun appearing a very large bright star occasionally passing through it. Most of the particles in the atmosphere that are responsible for scattering solar radiation are around 0.5 microns in size. As radiation with longer wavelengths is not affected by these particles, shorter wavelength radiation tends to be scattered more. This is what makes the sky appear blue. Electromagnetic radiation from the Sun is spread over a wide frequency range. Insolation contains electromagnetic wavelengths as short as 200nm (Ultraviolet) with maximum energy centred at around 400nm (Blue light). In addition to the spectrum of solar radiation there is also a spectrum of terrestrial radiation with a range spanning from 3000nm to 7500nm. This is basically the heart radiating from the surfaces of materials that have been heated by the sun. As previously discussed the solar spectrum includes energy at a wide range of wavelengths. When considering or calculating the spectrophotometric properties of any glazing product we are primarily interested in the energy wavelengths between 280nm and 2500nm, which covers ultra violet through visible light and on into the infra red. Figure 1 indicates the distribution of solar energy across this range of wavelengths. The visible range of solar radiation is the range of wavelengths of the spectrum between 380nm and 780nm. These wavelengths include the colours of the spectrum and taken together constitute what the human eye perceives as visible daylight. Ultraviolet (UV) radiation makes up a small part of the total energy content of insolation amounting to approximately 8% – 9% between 280nm and 380nm. From wavelengths 780nm through to 2500nm lays the infrared range of the solar spectrum. Solar radiation in this range of wavelengths gives us the physical sensation of heat, as this range of infra red radiation lies close to the visible part of the spectrum it is generally referred to as the “near infra red”.It is this infra red radiation that we feel on our skin when exposed to the Sun or a naked flame. In Addition to the spectrum of solar radiation there is also a spectrum of terrestrial radiation from the near infra red through to the far infra red at 7500nm. 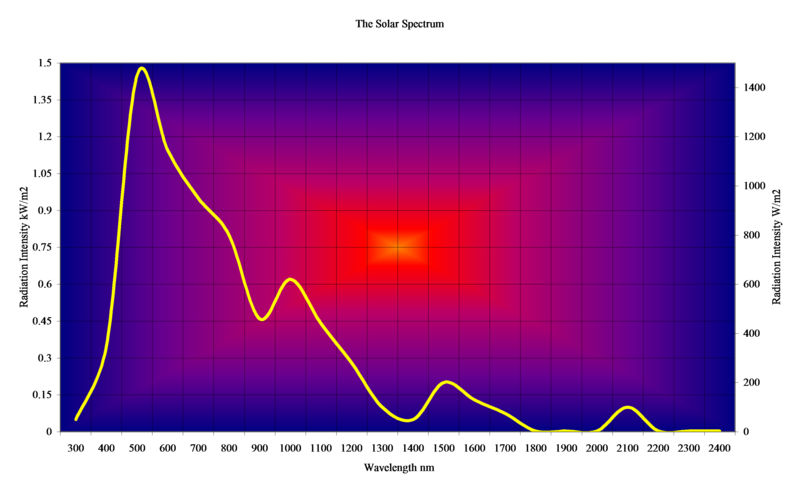 This is basically the heat radiating from the surfaces of materials that have been heated by the sun. When we consider glass for solar control there are a wide range of elements to take into account. Wherever glass is specified to reduce cooling loads in buildings it is important to consider the ability of the glass to control the transmission of heat not only from the direct influence of the Sun, but also the re-radiated heat from adjacent buildings after the Sun has gone down. ArcGlass coated solar control products have been developed to offer protection not only from direct solar radiation during daylight hours but also protection extending well into the infra red and therefore offer protection against long wave heat energy throughout the hours of darkness. Direct Solar Energy Transmittance (Te) is the proportion of solar radiation at near normal incidence that is transmitted directly through the glass. Solar Energy Reflectance (Re) is the proportion of solar radiation at near normal incidence that is reflected by the glass back into the atmosphere. Solar Energy Absorptance (Ae) is the proportion of solar radiation at near normal incidence that is absorbed by the glass. Total Solar Energy Transmittance (TET) also referred to as the Solar Factor (SF) or g Value in Europe, or as the Solar Heat Gain Coefficient (SHGC) in the USA, is the proportion of solar radiation at near normal incidence that is transferred through the glazing by all means. It is composed of the direct transmittance, also known as the short wave component and the part of the absorptance that is dissipated inwards by long wave radiation and convection, known as the long wave component.